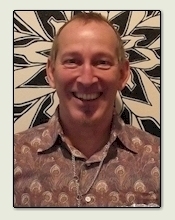 David Scott Meier lives on Sugarloaf Key, near Key West. Originally from California, he started painting at an early age and was encouraged by his father, a talented watercolorist. Meier attended The Laguna Beach School of Art in the 1970's where he studied and simultaneously operated a small gallery/studio. This visual experience is still evident in his execution of pattern in most of his paintings and a preference towards flattened, cubistic objects or figures. For his works' completion, Meier may use any or all of watercolor, acrylic, oil and gold leaf. Collage of paper and foils may be random or carefully patterned to add richer surfaces. The textures and designs, and humor, invite many more collectors to visit (and revisit) David Scott Meier's near-sighted worlds.